I remember just how striking it was seeing zombies shuffling across the African sand dunes, cast in silhouette by the orange light of dusk, in the Euro-trash cheapie OASIS OF THE ZOMBIES (1981). These solitary images stood out in what was otherwise a pretty useless, inept film. It seems the sibling filmmakers responsible for this one also saw that and knew there was a good film in there somewhere that could utilize those same memorable images to greater effect and put them to work in a better film, and that's exactly what we have here. As the film begins, we're in the midst of a worldwide zombie epidemic as an airplane carrying military and their families is heading across Africa and crashes into the ocean. American army flight engineer Lt. Brian Murphy (Rob Freeman) manages to get out of the wreck alive... but he's one of the few. Brian floats to shore on a crate and before he even has a chance to take a breath he spots zombies heading toward him from over the horizon. Two other survivors turn up; one seriously injured and the other, who's armed but runs off to save his own skin, but aren't of any help. Brian manages to break open the crate with a rock, gets his hands on a gun and then runs off into the dusty, thinly-forested mainland. Meanwhile, local soldier Sgt. Daniel Dembele (Prince David Oseia) returns to his village only to discover his wife has been killed, his son has been whisked away somewhere by soldiers and that the sole remaining villager left behind is a dying old woman who will soon have to be down herself. Brian - an engineer and mechanic by trade - makes his way to the same village shortly after Daniel leaves. He fixes up an old, beat pickup truck while he's there and then hits the road. When he gets hung up in some rocks and finds himself surrounded by a horde of zombies, Daniel shows up save him. The two men then strike up a bargain. Brian wants to get to an airport, fix up a plane and leave Africa. Seeing how it's nearly impossible to survive on foot and he has to go all the way to a military base across the country to reunite with his son, Daniel wants the truck. Brian offers to give it to him if he'll lead him to the nearest airport. And thus the main plot thrust; a road trip of sorts across dangerous, desolate terrain amid a rather hopeless and grim situation with dwindling supplies (water, ammunition, etc. ), is set in motion. I won't go into a full-fledged slow zombies vs. fast zombies debate here, but I will say that slow zombies can be used particularly well as tools to generate tension and suspense for isolated scenes as well as for casting a unique, unrelentingly dangerous mood over the proceedings. Always in their quiet, lurching, never-ending pursuit of human flesh, slow zombies can frequently be present in the background and do not necessarily pose an immediate threat to the protagonists; at least in small numbers. In other words, they can be placed anywhere within frame without immediately sending the film's characters into Rambo-mode. There's that constant, ever-present, depressingly solemn reminder that these things are never going to go away. You can kill one easily enough, but there are always countless more nearby to take its place. We need things like food, water, rest, sleep. They never do... and they never stop searching... The makers of The Dead fully understand all of this. Unlike so many others making these kind of films nowadays, they actually get what is special about the slow zombie and know exactly how to effectively use them. This is all clearly done with very-knowing reverence to what has come before it, particularly to the Romero series of films that began with the classic NIGHT OF THE LIVING DEAD (1968) and was expanded upon brilliantly a decade later with his equally good follow-up DAWN OF THE DEAD (1978). Aside from carrying over the mythology and utilizing the dead in the same fashion to evoke a similar mood and many of the same emotions from viewers, this also sidesteps actually explaining the origins of the zombie epidemic. The best the characters have are their own theories and there's a sequence here set around a campfire where a village leader discusses what may have happened that's in clear tribute to the famous "When there's no more room in hell..." scene from Dawn. With its stuffily hot locations and native zombies, The Dead also recalls ZOMBI 2 (1979) to a degree, but it far surpasses what Fulci did when it comes to utilizing the natural landscapes; going from a beach to inland, where the dead lurk in huts, abandoned buildings and overgrown fields of high, dead corn stalks, to some really amazing looking high rock formations by the finale. Though I quite enjoyed and appreciated the film overall and it falls soundly onto the "good" side of the flesh-eater spectrum, it doesn't have quite the depth, originality or inventiveness to elevate it to greatness. Though the acting isn't terrible, it's also not great. Only so much time is set aside to develop its characters and each of the two leads are given a standard push-along to be reunited with their families. The action becomes a wee bit repetitive in the middle, but thankfully things pick up again toward the end. The makeups are rather simple (slight undead pallor, some blood, blue contact lenses) but work well enough. The photography is rather nice throughout and though there's some use of shakycam, it's not overdone. All in all, they did a nice job here on a limited budget. Several production problems (camera equipment delivery delays, the lead actor contracting malaria while on location, etc.) ended up doubling the intended 6 week shooting schedule. It was filmed primarily in Ghana and Burkina Faso. After debuting at FrightFest in the UK, The Dead played a limited theatrical run in the U.S. in 2011 before receiving a DVD release from Anchor Bay. 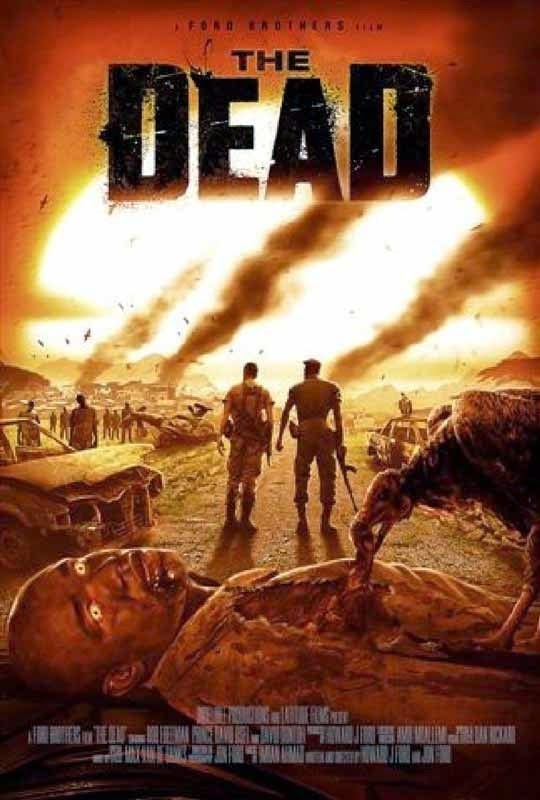 The same filmmakers completed The Dead 2: India in 2013, which has also been acquired for distribution by Anchor Bay and will be out later this year.